I was browsing TechCrunch when I came across this article. I’m not a fan of the iPad for several reasons that I’ll save for another post. I am waiting for something more along these lines. I’m not convinced that magazines are meant to live long, full, digital lives. They bring you the news of the day. The trends, the stories that entertain you while you’re at the gym, on the train or at the spa. A magazine is the old soul you met at the bar 10 years ago, or the relic that informs you of the last time you cleaned under your bed. Lost and forgotten, but also passionately cherished, for a short amount of time. I’m excited to see the evolution of iPads and print, and I hope there is a beautiful future somewhere in the middle of it all that is scalable and easy for the average consumer to afford. I was passing through Union Station the other day on my way to an interview, and I had the urge to board a train going anywhere. I’ll tell you where I am when I get there. I love sipping a strong cup of coffee, gazing out the window, pen and paper in hand, or iPod fully loaded, just taking in the sights. A beautiful mix of fleeting moments, a glimmer of time flickering alongside a pounding steel metronome. Personal highlights include ‘Whatever You Want’ and ‘Now Three.’ Tracks are a little dark and gloomy, but are pure and crisp at their melodic core. Perfect for a stormy afternoon. I’m a huge Patty Larkin fan, but this album (and Angels Running) are truly gems of this amazing singer/songwriter. Listen to ‘Open Arms’ and ‘Carolina’ on a sunny afternoon as you approach your final destination. I have a confession to make. I am a dedicated Tori Amos fan, but I have found her albums don’t make great train music. Enter Ms. PJ Harvey. Let’s go back in time (about 12 years ago) and listen to this raw and poetic album. Another favorite of mine from my trip up to Boston. Beautiful sonic backdrop while daydreaming about sailboats on the coast of Connecticut. Really want to zone out and relax? Listen to these beautiful Renaissance pieces for an hour or so. My favorites include ‘Miserere’ (how I long to have a chance to sing the soprano part in a cathedral somewhere) and Thomas Tallis’ ‘If Ye Love Me,’ a personal favorite that I performed in my high school Madrigal troupe. Top notch. Another great album that works nicely if you are headed up north on the train, and are trying to mellow out from the work week. ‘I Remember’ and ‘Step One Two’ are definitely worth a listen. What are some of your favorite Train Trip Albums? Have any thoughts on my Top 10 picks? While cleaning out my childhood bedroom last week I came across a letter. Not from an international pen pal or a secret admirer. From a Canadian flavoured sweet sparkling water company, Clearly Canadian. I was a Clearly Canadian groupie. As a pre-teen I loved nothing more than opening up my Teen or YM magazine and calling the 1-800 numbers listed at the bottom of the ads on those colorful, glossy pages. I wasn’t seeking coupons. I wasn’t looking for a hobby. I had friends. I genuinely wanted to form a relationship with these companies. Give and take. I was clearly ahead of my time (hello, Twitter) and was looking for an instantaneous solution to interact with these brands. Best thing about it, (remember these were the early 90’s,) they wrote me back. They sent me decals, letters of thanks from their customer service departments and they graciously thanked me for my interest in their product. Plain and simple. I was 10, and had no buying power. It was nothing more than an innocent consumer rendezvous. Once the internet came about, I had no reason to call the back of shampoo bottles anymore. No real reason to inform the representative on the other end that my hair, was indeed, softer, more manageable. Now I could post my thoughts on a message board, or an emotionless company feedback form. It was the end of an era. Nothing beat the excitement of dialing up my powerful (yet gentle) exfoliating face cream, my Monday morning cereal box or my lilac citrus air freshener, to make me feel like someone out there in the corporate world of consumer household products, was listening. Yesterday was dark. Rainy. I felt really inspired. As mentioned in yesterday’s post, I started writing in this blog again. I cleaned out a few entries, changed up the theme, and here I am. 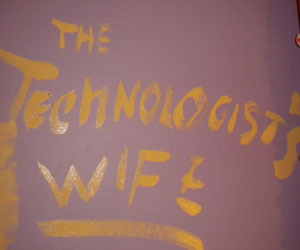 I’m painting over the nearly deafening shade of Barney purple in my childhood bedroom at my parent’s house. Painting is cathartic and I’m excited to see the finished product. I am also cat-sitting for my parents as they travel to North Carolina for the week. 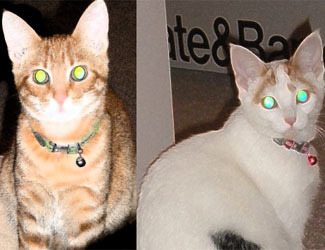 Here is a semi-artistic Photoshop inspired picture of the cats. Stir the cornstarch, stock, soy sauce, brown sugar and garlic powder in a small bowl until the mixture is smooth. Stir-fry the beef in a 10-inch nonstick skillet over medium-high heat until it’s well browned, stirring often. Pour off any fat. Add the broccoli to the skillet and cook for 1 minute. Stir in the cornstarch mixture. Cook and stir until the mixture boils and thickens. 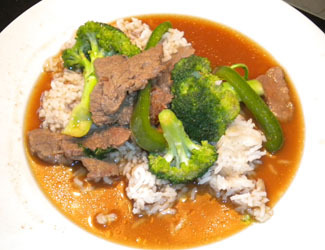 Serve the beef mixture over the rice. I was seriously craving vegetables, so I threw in some broccoli and green peppers. The dish could have used some crab wontons, but it was still a flavorful dinner. It paired nicely with a glass of Chardonnay. The rain came out of nowhere. The clouds a constant reminder of wading days and soft black pavement, circles and circles of seasons without end. Okay, I feel somewhat inspired now that I’ve changed by blog’s background. Be back in a bit.